HONOLULU – Gov. David Ige joined representatives from state, federal, county, and community organizations to launch the annual Click It or Ticket campaign during a proclamation signing ceremony at the State Capitol today. Click It or Ticket stresses the importance of using seat belts, child passenger restraints and booster seats. In 2014, 61 percent of fatally injured motor vehicle occupants in Hawaii were unrestrained. Research from the National Highway Traffic Safety Administration (NHSTA) estimates 45 percent of those deaths could have been prevented through use of lap/shoulder seat belts. The national Click It or Ticket enforcement campaign, which began May 23, 2016 and runs through June 5, 2016, reminds all drivers and passengers to buckle up. The goal of the campaign is to save lives through seat belt use. Law enforcement agencies in all four counties will be stepping up their enforcement activities during the Click It or Ticket mobilization period, taking a no-excuses approach to seat belt law enforcement. During federal fiscal year 2015, 13,934 drivers in Hawaii received citations for failure to use a seat belt. In addition, 1,691 drivers were cited for failure to secure a child under the age of eight in their vehicles. Hawaii’s universal seat belt law requires that all front and back seat motor vehicle occupants buckle up. Adults and children must use their seat belts and child passenger restraints at all times. The fine for unrestrained occupants on Oahu, Hawaii and Maui is $102, and the fine on Kauai is $112. Drivers will receive one citation for every unrestrained occupant in the vehicle. Violators of child restraint law are required to appear in court, and if convicted, are required to attend a four-hour class and may be assessed a penalty of $100-$500. In 2014, nearly half of the 21,022 passenger vehicle occupants killed in crashes were unrestrained. In 2014, seat belts saved an estimated 12,802 people. From 2010 to 2014 seat belts saved nearly 63,000 lives. Statistics show that motor vehicle crashes are responsible for more deaths than violent crimes. In 2014, one motor vehicle fatality occurred every 16 minutes, compared to one murder every 37 minutes. Additionally, one person was injured in a motor vehicle crash every 13 seconds compared to one violent crime every 26.3 seconds. If all passenger vehicle occupants five years of age and older involved in fatal crashes had worn their seat belts, an additional 2,814 lives could have been saved in 2014 alone. Among young adults ages 18 to 34 killed in motor vehicle crashes, 57 percent were completely unrestrained – one of the highest percentages for all age groups. In 2014, there were 602 children ages 12 and younger killed in motor vehicle crashes. Of those deaths, more than 34 percent were unrestrained. During the national Click It or Ticket mobilization, and throughout the year, police statewide will continue strict enforcement of the state seat belt and child passenger restraint laws. This media and enforcement campaign is 100 percent federally funded by the NHTSA. 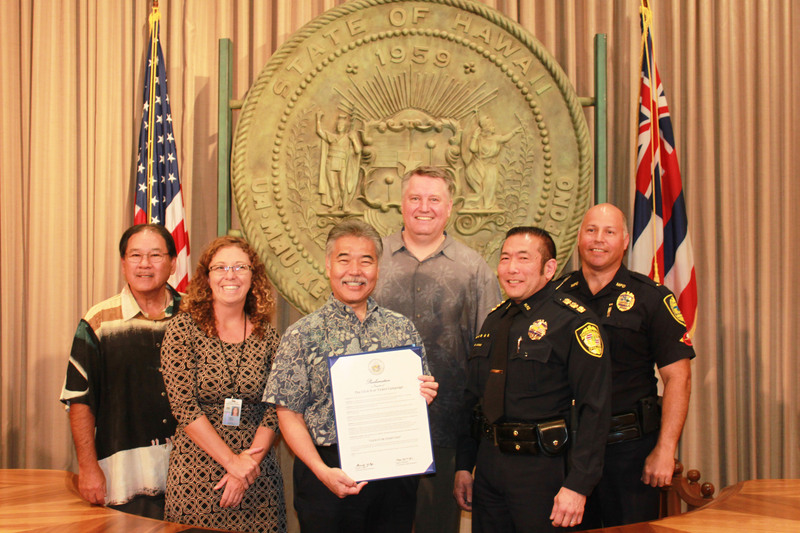 Governor David Ige issued a proclamation to initiate the Click It or Ticket campaign.